In the Friesian breed, there are few horses that can boast as impressive a track record as Sjoerd. 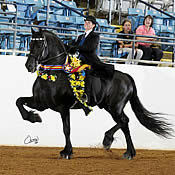 In his young six years, the stallion has amassed 38 Lifetime World/Grand Champion National Champion titles and has earned more career points than any other Friesian in the history of the International Friesian Show Horse Association (IFSHA). It comes as no surprise that Sjoerd is the only one of his breed to have twice been named the United States Equestrian Federation’s (USEF) Friesian Horse of the Year. 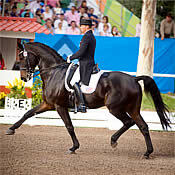 In 2011, Sjoerd earned 14 World/Grand National Champion titles and four World/Grand National Reserve honors. In addition, the stallion was undefeated for the year in halter. While his first foal crops are only yearlings and weanlings, they are winning top honors in the show arena, demonstrating Sjoerd’s strength as a breeding stallion as well. “Dynamic and a Diva” are the perfect words to describe this 15-year-old mare. With the young Leah Beth Boyd in the stirrups Starr Llight ended up on top after the ride-off for the prestigious Open Purebred English Pleasure title on Saturday night at the 2011 Arabian National Championships. In doing so, the mare became the most winning Purebred English Pleasure mare of all time and only the second mare since 1988 to win the prestigious title. At age 15, she was also the oldest mare, and second oldest horse overall, ever to garner the coveted award. Purchased by her young owner in 1999 from a dispersal sale, this mare has gone on to win 11 National or Reserve Championship titles. 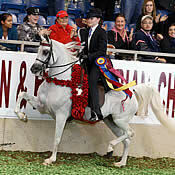 The pair is the only Arabian horse/rider team to ever win a National Championship in the Junior exhibitor, the Amateur exhibitor, and the Open division. 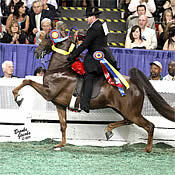 When it comes to the Five-Gaited division for Saddlebreds, CHThe Daily Lottery was a jackpot payout in 2011 with an undefeated record among amateur competitors. From the string of Grand Champion titles at the UPHA/American Royal, Kentucky Fall Classic, Midwest Charity Horse Show, Bonnie Blue National, and the Kentucky State Fair World’s Championship Horse Show, this impressive chestnut gelding dominated the scene like no other. In fact, this has been the case well beyond this year’s competition calendar, as the 7-year-old has long been outperforming his competition in the show ring with his rider, Gabe Deknatel. Trained by John and Tammie Conatser, CHThe Daily Lottery is handsome, fast, beautifully big motioned – and seemingly invincible. Though small in stature (15.3h) and nicknamed “Shrimp,” Coral Reef Via Volo is a giant when it comes to jumping. With Beezie Madden, she topped the Rolex/USEF Show Jumping Ranking List for much of the 2011 competition year, and went on to impress the world at the Pan American Games in Guadalajara, Mexico. She led Team USA’s Gold-medal effort, which also secured 2012 Olympic qualification. She added only one time fault through five rounds of jumping and won Individual Silver to back up the Team Gold. In 2011 Via Volo and Madden racked up numerous wins across the globe. 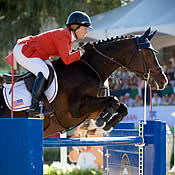 They were on the winning team in the Nations Cup at the CSIO4* Wellington. They won the D-LINE Cup 1.60m Spruce Meadows, and the Longines International Grand Prix of Rotterdam (CHIO). Having won their first competition together only a year ago, this new partnership has proved an incredible one so far. 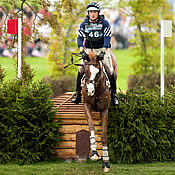 2011 marked a year of tragedy for eventing rider Boyd Martin. He lost six horses in a horrific barn fire on Memorial Day but was able to save five. One of those saved was Neville Bardos. The failed Australian racehorse was trapped in the fire for nearly 45 minutes before Martin was able to pull him out. Neville suffered burns and severe smoke inhalation that required extensive rehabilitation. The prognosis was grim, but he fought through it and defied every odd. He made a miraculous recovery to return to competition two months later. Martin lost his father and father-in-law over the summer and he set a big goal for Neville to try to get him through the tragedy. Neville and Martin went on to not only compete in the CCI4* at the Land Rover Burghley Horse Trials – but they placed seventh out of 81 entries in September. He jumped only one of nine double-clear cross-country rounds over arguably the world’s toughest cross-country track. Weltino’s Magic and Steffen Peters were undefeated in 2011, winning at the Intermediaire I level at the Festival of the Horse CDI and the Del Mar National CDI in California before heading to CHIO Aachen and taking on the best small tour horses in the world. They continued their unbeaten streak in Aachen, Germany, and then returned home to sweep all three tests in the USEF National Intermediaire I Dressage Championships at the 2011 Collecting Gaits Farm/USEF Festival of Champions in September to earn their spot on the U.S. Team for the Pan American Games. They set a remarkably high standard at the Pan American Games and brought home Team and Individual Gold medals. ‘Magic’s’ character comes through in his performance and he has evolved into a top contender. Started by Peters’ wife, Shannon, together they were the reserve champions in the Markel/USEF National Young in the Six-Year-Old division. Peters took the reins in 2009. Two of these six exceptional horses will be honored as the overall 2011 USEF Horse of the Year, a mark of distinction that will last a lifetime. Now, it is up to you to decide who will receive the top tribute in 2011. Simply visit http://www.usef.org/_IFrames/hoty/Default.aspx and type in your email address to access the voting portal. Voting will end at Midnight [ET] on Monday, January 2, 2012. For more information regarding the Equestrian of the Year program or any of the six Horses of Honor, contact Trisha Watkins, USEF Awards Manager, at 859.225.6944 or tlwatkins@usef.org. Previous Post2012 Alltech National Horse Show Set for October 31 through November 4thNext PostUSEF Announces the 2011 Equestrian of the Year Nominees; Voting Is Now Open!